Wow, what an incredible weekend! We were blown away to even be nominated for a Grammy for ‘Bluegrass Album of the Year.’ It was a such an amazing honor to win this award, which we shared in a tie with Rhonda Vincent & the Rage. We are really proud of Laws of Gravity, an album of all original music that we self-produced along with our amazing engineer, Billy Hume. To be recognized for an original statement by the music world’s biggest awards ceremony was truly an honor. The amount of hours and energy that go into making this band go is simply insane. We love what we do, but it never ever lets up, and sometimes it’s hard to have perspective on what exactly you are accomplishing in the process. This was a beautiful moment for us as a band, and as brothers, to step back, enjoy what we have created and appreciate all the hard work that we have all put in. There are many people to thank, including our friends and families, our managers–Chris, Alex and Phil, our booking agent Josh Knight, our amazing road crew (Katrina, Drew, Jason, Cameron, Tracy and Wynn), Compass records, our publicist Todd Brodginski, our business manager Ben Coe, everyone at NARAS who voted for us, the Whales, and last but not least all of our amazing fans who keep this train rolling night after night. We love you guys! Thanks you!! I also want to give a shoutout to our co-winner, Rhonda Vincent and the Rage, and the other nominees in our category: Noam Pikelny, Michael Cleveland and Flamekeeper, and Bobby Osborne. This is a diverse, amazing cross section of all that is great about Bluegrass music in this day and age. We represent different eras of the music, and perform in a wide variety of settings for many different types of fans. 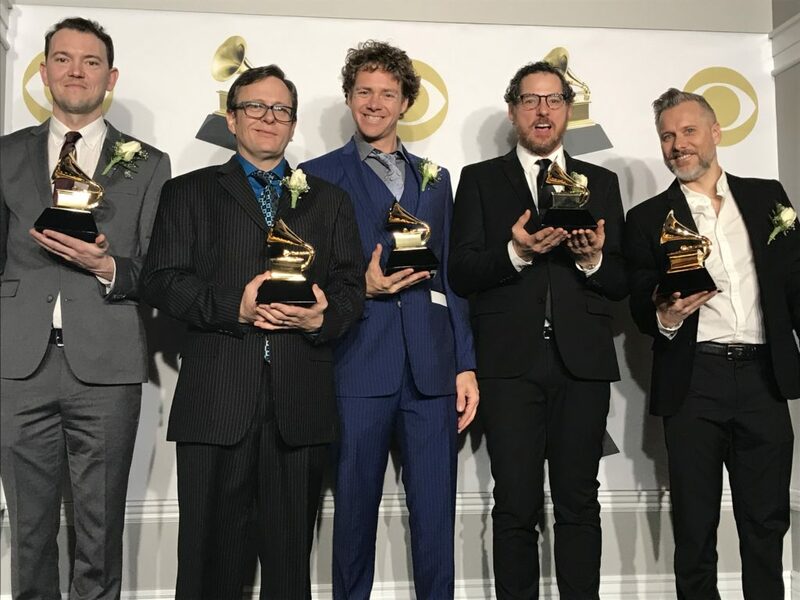 While it is true that some forms of Bluegrass are experiencing more success and notoriety than others, the music that our fellow nominees make is all outstanding, authentic and worthy of this kind of attention. All these acts have clear connections to the deep tradition behind the the music: the virtuosity, the songcraft, and the powerful acoustic tones. But they also represent much creativity and vision, each in their own way. We are so proud to be a part of this world and to be representing #Bluegrass as we travel all over the country playing the music we love. Hopefully the Stringdusters will play a part in helping the music grow, reach new people, and continue to evolve for many years to come.